RAnt(hony)-ings – Page 96 – Don't Get Me Started. Author ranthonysteelePosted on August 18, 2006 Categories SpaceTags Astronomy, Category, Planets, Pluto3 Comments on So, How Many Planets are There, Anyway? There is a recurring cyclical argument in politics that is due for another ressurection. Every election cycle some variation of Clinton’s “It’s the environment, Stupid” is trotted out by desperate Democrats, and it generally plays well. Global warming is just another variation on the theme, as Al Gore and his film An Inconvenient Truth readily prove. More recently, the National Academy of Sciences came out with a study that supposedly proved beyond a doubt that human activities were responsible for ”global warming”. A chorus of voices in the media, in politics and in academia proclaimed that this was no longer an issue but a scientific fact, proven with hard data. The NAS report not only had statistics, it had an impressive list of scientists, which supposedly put the icing on the cake. …And let the concerned private citizens handle the issues. As the world’s biggest polluter, the US gov’t doesn’t have any business pretending to care about the environment. The EPA is necessary. In fact, the EPA isn’t powerful enough which is its major flaw. Superfund? That is a bought congress weakening the EPA from outside. The corrupting effect of money on the government. What we need is a global authority on the environment. I just hope we’re smart enough to craft an organization that will do the job it needs to do without becoming a totalitarian regime all by its lonesome. Able to protect natural resources without crushing human ability to use them. That task will redefine the phrase balancing act. Author ranthonysteelePosted on August 12, 2006 Categories Environment, Politics2 Comments on It’s the Environment, Again? DC City Council Approves Temporary Expansion of Video Surveillance was posted to a list I belong to today with the body of message being “And so it begins”. Begins? This is just the latest phase here in the US. In Britain and in many other places across the world, this type of technology is already in place, being used by gov’t to keep track of it’s population on a day to day basis. This is not a beginning, it’s an ending. The beginning is lost to history. Perhaps it occurred following the Civil War; when the gov’t that succeed Lincoln’s, fused what was a collection of independent states into a federal conglomerate that would be henceforth declared “indivisible”. Perhaps it goes all the way back to the time of the founders, when Alexander Hamilton got in bed with the bankers of his time and created the first central bank in the US. Whenever the ‘beginning’ was, it makes very little difference now. The current (and growing) police state has very little to do with the free nation that existed before it. As the old adage goes, frogs will jump out of hot water, but will stay put until it’s too late if the temperature is slowly raised. …It’s getting very hot around here. The entirety of this post is a slippery slope fallacy. As much as any one of us can see 1984 in the surveillance technologies in use today, there is also no denying that crime is averted or solved, lives are saved, with this technology. The real question is, where do we draw the limits? That is the conversation that (still) needs to occur. First, a frog cannot jump out of boiling water. Remember the last time you dropped some egg white into boiling water: the proteins coagulated into a mess of thin, white strands. Unfortunately, the proteins in the frog’s skinny legs would do the same thing. So the frog in boiling water could not jump anywhere. It would die a nasty death. I’m just not buying this latest wind up. What commonly available household fluids could be taken on board a plane (in sufficient quantities) and when mixed, would yield a high enough explosive result to bring down a plane? I can’t help but think how convenient the timing of this all is. Senator Lieberman, the only pro-war Democrat in congress looses his parties nomination. Blair, Bush, et al are looking more and more like idiots these days; Iraq is a morass, the Middle East is in full melt down mode, and the UN is trying to stop Israel from cleaning house in Lebanon. …What better way to motivate the populace to get back on the “Terror War bandwagon” than a good ol’ foiled terror plot? Given my attitude, I’m sure no one would be shocked that I carry a wallet full of these cards around with me: http://www.goohf.com. 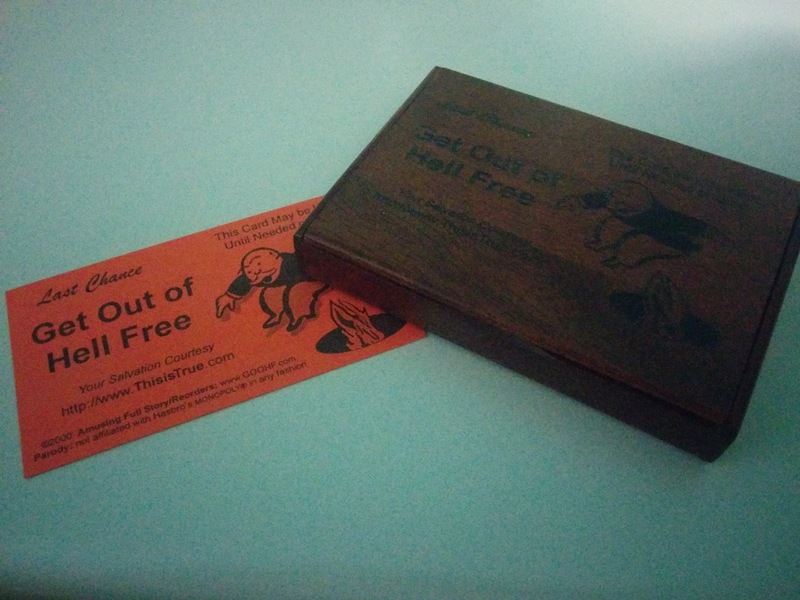 I hand them out to anyone who’s having “one of those days”. Apparently, I’m not the only one: http://www.goohf.com/million.html. I’ve never gotten a negative response. I’ve always received at least a smile in return, which can be quite an achievement, depending on how bad the day is. Finding something funny even in the worst situations is one sure way to alleviate stress (and as someone who’s Meniere’s trigger is stress, it’s important to know how to get rid of it) so I follow Saltheart Foamfollower’s advice and laugh, for “Joy is in the ears that hear”. I’ve gotten some pretty strange looks over the years, laughing when there isn’t anything to laugh about. After twenty years experience in the architectural industry, when the boss once again shaves 30% off of all your estimations of time and money, and expects you to complete the project with no errors anyway, truly “it is to laugh”. Getting angry just makes the time pass more slowly. I was reading a review of the Da Vinci Code movie over at the Atlasphere (The Da Vinci Code: Fighting Faith and Force) the other day, and noticed one of the links at the bottom of the page labeled “the U.S. Catholic Bishops Brown-bashing site” I found the link intriguing, so I clicked on it. The actual title of the page was the funny part. “Jesus decoded“, it proclaims. That’s a great idea. Maybe they can explain the trick with the fishes and the loaves of bread, or perhaps the walking on water. That would be good to know. The most important trick, of course, would be the changing of water into wine. Very popular at parties, I would imagine. Too bad this sort of insight wasn’t available to Judas ‘back in the day’. Might have saved him a lot of missteps. “Who are you, what have you sacrificed?” One of the most memorable lines of lyrics from Jesus Christ Superstar. Judas, as one of the disciples, should have known how to ‘decode’ Jesus. Obviously it isn’t as easy as the Catholic Bishops would have us believe. 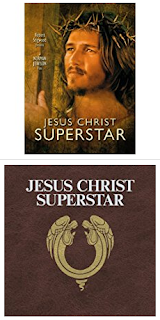 A fondness for Jesus Christ Superstar is one of the few things that remains constant from my days as a ‘born again’ to my current ascribed atheism. I picked up the DVD recently and watched the movie for the first time. Alamo Drafthouse aired snippets of the movie between showings of The Da Vinci Code (I have written about the movie and the book before) and it intrigued me. I’ve listened to the Jesus Christ Superstar soundtrack since the early eighties, but I’ve never had the occasion to watch the film made from the play. Little did I know that the soundtrack was in fact the original version, created before the play even took shape. That makes it all the more interesting to me that they chose to alter some of the lyrics from the soundtrack in making the play and the film. One of the most telling lines, for me, has always been Jesus’ despairing declaration to the lepers “Heal yourselves!” which is the last line in that song on the soundtrack. The movie uses a much more ambiguous “Leave me alone!” to end the song. I prefer the more empowering declaration, myself. More fitting in describing what is wrong in the world today. The vast majority of people seem to think that what they need to fix themselves is external to their selves; when, obviously, the answers lie within. Judas fails to comprehend were the answers lie as well. The movie, album, etc. ends with Judas still asking questions of Jesus (which still plays quite well) when the real question is why Judas would turn in the man he professes to love. Jesus Decoded, indeed.